Stop dirt in its tracks! The number one mat for absorption, dirt holding properties. Save on your cleaning costs, works great for both industrial and household applications. Ideal solution for busy industrial / commercial building, restaurant, retail stores, hotel, hospital, public institution, sports and leisure areas. Perfect for a doorway from outside of your front yard or your garden. Stops grease from your kitchen. Picks up and holds dry dirt and grit. Collects 95% of moisture and dirt from the soles of shoes Cotton with non-slip PVC-free rubber backing. 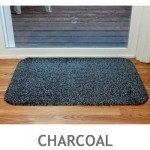 Available: 2 colors and 3 sizes; Charcoal and Tan, and 3 sizes; Regular (50cm x 76cm, approx. 20” x 30”); Commercial (76cm x 100cm, approx. 30” x 40”) and as a Runner (76cm x 152cm, approx. 30” x 60”).